Dallas was making a terrible barking racket yesterday morning. At first, I thought he’d cornered a squirrel, but then I caught sight of these migrating birds. Geese, perhaps? This entry was posted in Seasonal and tagged birds, geese, migrating, nature. Bookmark the permalink. Nature is amazing for sure! Thanks for sharing! Thanks for stopping by, Beth Ann — always lovely to see your happy smile! You said it Debbie….AMAZING indeed! And I love the quote shared! This is why I relish spending time outdoors, sitting in the park; taking long walks; and walking along the river waterways we have here. I love city life, however, I need that connection with nature as well, for balance. Great photo capture and video clip! Have a faaaaaaaaabulous Monday, my friend! Isn’t that just the most relatable quote?? Glad you liked my birds — I was surprised at how FAST they flew overhead. If I’d taken time to grab my camera instead of my phone, they’d have all been gone! Excited … or terrified, I couldn’t tell which! They were making such loud squawks and honks that it sounded as if they thought something fierce was after them. Probably they knew snow showers were on the way! They do seem to know these things! It is for sure! And what a racket :-D. Pood Big D. Weather headed our way! Did they fly over your house, too, Kb? From the best I could see, they were headed in a northwest direction, so they might have missed you. Maybe they were going to the Super Bowl, ha!! Kind of like ants, huh, Cindy!! Nature is amazing. We don’t get geese so this was a real treat. Glad you enjoyed seeing them, John. Dallas and I did, too! What a wonderful sight. 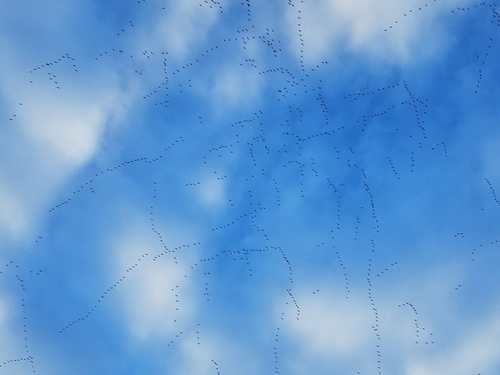 The geese used to come over my area, but their flight patterns have changed, so I rarely see them now. I did see a flock of sandhill cranes on Sunday. There weren’t nearly so many, and they are quiet sorts — no honking and such when they fly! You’re right that they move fast. I’m so glad you captured them, and thought to share them with us! I’m glad I was able to, too. It seemed like the cloudy skies cleared off just enough for me to get a decent capture, and it was comfortable enough outside that I never missed my coat. In hindsight, if I’d taken time to bundle up and position the camera for the perfect shot, I’d have missed them! We regularly have geese of some kind here year round. There are plenty of retaining ponds and lakes for them to enjoy. And I often see a few of them (a countable number) soar across the sky. This was way different. It looked like a colony migration due to the number of participants. Which kind of leads me to wonder, How do they know when and where to fly?? I don’t guess they were heading your way. From the ground, it appeared they were flying toward the northwest, perhaps Minnesota? ?